Deeply rooted within the New Hampshire landscape, traditional arts have been passed on and preserved beginning with our indigenous communities through European settlement to the newly emerging New American and ethnic communities of today. All of us belong to communities or groups that have something in common--a language, a geographic area, an ethnic heritage, a religion, an occupation, or a way of life. Each group, both old and new, express their own traditions, arts, music, crafts, stories, and values that are a vital piece of New Hampshire’s living cultural heritage. Traditional arts connect us to our past, encourage respect and appreciation for diverse cultures and traditions, build strong communities, and cultivate cultural assets. As society and communities continue to evolve, it becomes more and more important to celebrate and learn about our traditions. To help our youngest residents learn about a wide range of traditional arts that are practiced in the Granite State, the N.H. State Council on the Arts’ Heritage and Traditional Arts Program developed the Folk and Traditional Arts lesson plans to increase the awareness and appreciation of local art forms and cultural traditions through K-12 connections. 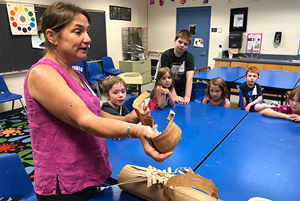 Designed for 4th and 5th grade classroom teachers who have no prior experience in the arts, the lessons focus on a wide range of traditional art forms including French-Canadian Music and Culture, Contra Dancing, Fly Tying, Abenaki Beadwork, Bhutanese Folk Arts and much more. Sharing the cultural and artistic traditions of a community offers opportunities for youth to engage in hands on learning, make connections to their own culture as well as others, develop empathy and understanding for diverse cultural expressions and affirms what makes their own community and New Hampshire a distinct place to live. These interdisciplinary connections and skills can be used to support the curriculum of other subjects including social studies, language arts, geography, earth science, mathematics and - of course - visual arts, music, dance and theatre, thus providing a more meaningful and successful foundation for engaged citizens. 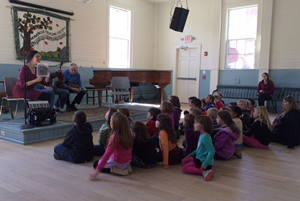 To access the NHSCA’s Folk and Traditional Arts lesson plans, please visit the NH Folklife website and click on the Learning Center. We welcome your feedback as you implement these lessons! 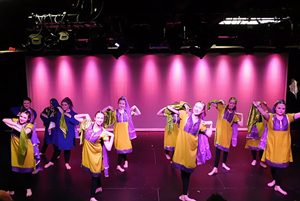 Granite State Arts Academy students performing a Traditional Indian Dance during the culmination of an Artist in Residence program by Master Artist Jasmine Shah. Nelson Elementary School students learning about Albert Quigley and his impact on Nelson by Master Artists Allison and Hunt Smith and Harvey Tolman. Master Artist Alice Ogden teaching basket weaving to students at Holderness Central School. 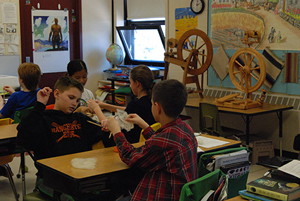 Students working together to spin wool during a lesson at Weston Elementary School in Manchester.